The “undue burden” requirement of the 1992 Planned Parenthood v. Casey decision has been a door which the right blasted wide open, imposing hundreds of reactionary laws. This 1992 decision has now been modified to take medical reality into account. 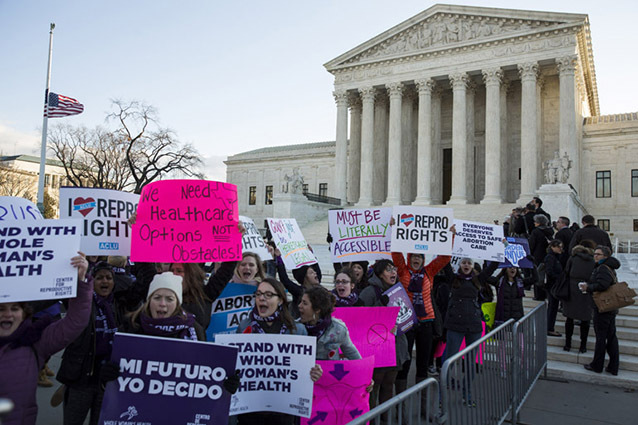 The 5-3 Whole Women’s Health v. Hellerstedt ruling swept aside legislation that forced the closure of nearly two dozen Texas clinics and, if upheld, would have reduced the number to around ten, all in major urban centers. Activists demonstrate outside the Supreme Court as the Court hears oral arguments in March 2016. The strength of the decision is the result of serious preparation and mobilization of organizations that understood the stakes involved. Forty-five amicus briefs filed by a number of medical, legal, and women’s organizations and individuals outlined the situation women faced as 41 clinics performing abortions were whittled down to 19. These briefs discussed the particular barriers African-American women and Latinas faced, hammered home the point that the law was not medically necessary, and set reproductive rights within the larger framework of women’s health and human rights. Three aspects of the decision are far-reaching. First, the court sets medical evidence as the basis for restricting women’s access to their constitutional rights. This directly challenges the strategy the right wing has utilized, called Targeting Regulation of Abortion Providers (commonly referred to as TRAP laws). They have justified this approach, claiming these laws were written to protect women’s health. But now medical opinion, and not ideologically motivated roadblocks that drive up the cost and even force clinics to close, will be the standard. This is also a refutation of the argument used by the Fifth Circuit Court of Appeals, which had upheld the law by accepting the legislature’s motivation. Second, the ruling is not a narrow one applying only to Texas. Rather it provides a standard through which TRAP legislation in two dozen other states can be immediately challenged. The requirement of admitting privileges at nearby hospitals for doctors performing abortions is particularly onerous since many hospitals, particularly Catholic hospitals that represent a growing portion of all hospitals, are hostile to abortion. As the Court majority noted, other medical procedure, from childbirth to colonoscopies and dental surgery, are safely performed outside hospitals, and need no special admitting privilege legislation. Before the Texas law was enacted, abortion clinics were able to arrange transfer agreements in the few cases where complications required hospitalization. Third, in setting medical evidence as the reason for a restriction, the ruling opens up for review a host of other restrictive laws. These include banning specific abortion techniques used in first- and second-trimester abortions as well as waiting periods, mandatory counseling often riddled with misinformation, and the requirement for sonograms even when most are medically unnecessary. Additionally, as medical technology and communication methods have developed, clinics in the rural areas of many states have successfully administered non-surgical procedures. In the case of abortion, women in the early stages of pregnancy can be examined in a nearby clinic by a nurse. Then a doctor, communicating over Skype, reviews the information and initiates the procedure with abortion-inducing drugs. At least five states have outlawed nonsurgical abortions, but not other nonsurgical procedures. This Whole Women’s Health v. Hellerstedt decision is a setback to the right-wing’s agenda of limiting access to abortion through laws clinics would have difficulty meeting. The right will certainly not abandon its work to severely limit the range of women’s reproductive rights, but the standard introduced by the recent decision is an important tool for supporters of women’s reproductive freedom. While the women’s movement was never able to win our demand for free abortion, for more than forty years women have continually asserted our rights. Through the years networks of supporters have contributed to funding poor women who needed abortion. Certainly the demand for single-payer health care is crucial to expanding women’s access to a range of health care, just as the unfulfilled demand for quality child care remains before us. For more background on the case and the Texas laws, see “Trouble in Texas,” in the May/June issue of Against the Current. Dianne Feeley was active in the pre-Roe v. Wade fight for reproductive rights, is a retired autoworker active in defending Detroit homes against foreclosures and evictions, and is an editor of Against the Current.